Albuquerque, NM – While most people are thinking about the end of the school year coming up in the next few weeks, the employees at Modrall Sperling Law Firm have turned their attention, and their outstanding fundraising efforts, to the start of the next school year. Spearheaded by Eric Plegge and fostering the firm’s competitive spirit, employees have worked together to raise funds to provide backpacks filled with school supplies for the students in the Albuquerque Public Schools Title I Homeless Project — in honor of the firm’s 75th Anniversary and as part of a unique campaign to encourage community service among its staff as a way of “giving back” to mark the anniversary. Through the “75 for 75” campaign, bake sales, lunches, donations and other activities, employees raised more than $5,000 for backpacks and supplies for students in need — and partnered with Sandia Office Supply, who also rose to the occasion to provide these much-needed school supplies at cost…as well as donate additional supplies. 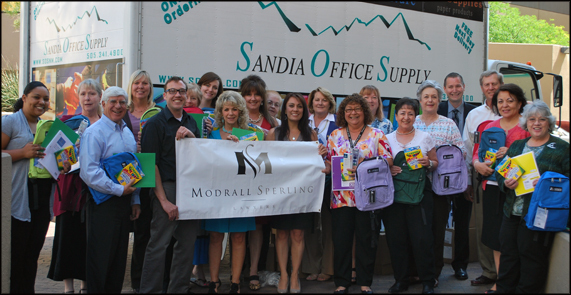 Sandia Office Supply delivered the supplies to the firm’s offices on May 17th — where employees from both Modrall Sperling and Sandia gathered to fill the backpacks for distribution to the students. As always, the need for backpacks and school supplies is a constant. The result of this fundraising effort is an important step in helping to ensure that all APS students have the tools they need to continue their education. Additional community support would be extremely appreciated in securing additional donations and backpacks/school supplies for the APS Title I Homeless Project and the many students it serves. About Modrall Sperling: Celebrating its 75th anniversary in 2012, Modrall Sperling is a full-service law firm with offices in Albuquerque and Santa Fe. Founded in 1937, the firm is one of the region’s most respected law firms, and with more than 80 attorneys, has grown to be the largest law firm in the state. Modrall Sperling is a leader in civil law representing local, regional and national clients, and has gained a reputation as a dynamic law firm capable of managing the most complex issues in business law today. The firm’s attorneys have consistently been recognized for excellence in their practice areas in prestigious independent listings including Benchmark Litigation, Best Lawyers in America, Chambers USA and Southwest Super Lawyers.